• A few below are clerics or preachers, but it’s not clear if they are recognized Sharia scholars, so I list them here as politicians. Sometimes it’s hard to tell, and often a person is more than 1. 1) Recep Tayyip Erdogan - Turkish prime minister since 2003, former mayor of Istanbul, was #4 in the book co-authored by John Esposito featuring the world's 500 most influential Muslims. Turkey is seen by many as a model Muslim country for the Middle East, worthy of being in NATO and EU, and also a prime example of how a state with strong measures in place to hold political Islam in check with a secular military, can slowly become an Islamic state non-violently. As in Egypt 2012. "Democracy is like a street car; you ride it as far as you need, and then you get off." 2012 - Says Islamophobia™ should be recognized as a “crime against humanity”. In August 2014 as the new Islamic State butchers Kurds and Iraqis, Erdogan’s Foreign Minister defended ISIS against accusations of Terrorism. Here is a chronological listing of stories since his imprisonment showing his rise to power, and Turkey’s slide into sharia today. 3) Maulana Motiur Rahman Nizami (1943- ) - Masters Islamic Law with distinction. In 2009 50th most influential Muslim in the world in Esposito’s book. Current leader of Bangladesh’s largest Islamic party Jamaat-e-Islami, and author of 54 books. In July 2011 Nizami and 3 other senior JI leaders were arrested in connection with war crimes. Bengalis claim the Pakistani Muslim army and local collaborators killed as many as 3 million people during the 1971 war that ended in Bangladesh's independence from Pakistan. The four reportedly led Islamist militias targeting independence supporters and religious minorities, mostly Hindu. "... the day is not far off when... our youth will raise the victorious flag of Islam the world over by defeating the Hindu Army and finishing off Hindustan". (Daily Sangram, November 14, 1971) More Nizami. 8) Sayyed Ayad Jamal Al-Din - Shiite, former Iraqi MP, in November 2010, said Western human rights “do not exist in Islam”. 9) Benazir Bhutto (1953-2007) - Harvard and Oxford educated, 1st woman elected to lead a Muslim state, PM Pakistan in 1988 & 1993. Assassinated trying to make a come back in 2007. The Press Trust of India calls her "an uncompromising champion of democracy and a moderate face of Islam." “The people of Kashmir do not fear death, because they are Muslim. 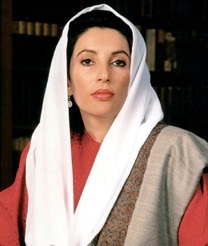 The Kashmiris have the blood of the Mujahids [Jihadists]... because Kashmiris are the heir of Prophet Muhammad, Ali and Umar.” Islam Watch Benazir Bhutto Bhutto "Champion of Moderate Face of Islam"? - What’s wrong with the term. 10) Note the first 2 are not extreme enough within Islam to be disciplined, replaced, or declared non-Muslim. 12) Sheikh Abdullah Nihari - Raymond Ibrahim wrote “One need not understand Arabic to appreciate the intensity of Nihari's hate” in this clip. 15) Houari Boumedienne (1932-1978) - Algerian President, in a speech at the U.N. in 1974. 16) Ali Akabar Hashemi Rafsanjani (1934- ) - President of Iran 1989-1997, often called a Moderate™, was a pupil of Ayatollah Khomeini at Qom theological seminary reaching the rank of Hojjatoleslam, which is not that high, so not really a sharia scholar. “Have no doubt... Allah willing, Islam will conquer what? It will conquer all the mountain tops of the world.” 7/25/05 (MEMRI) More Ahmadinejad. • You already saw Sheik Qaradawi, Egypt’s Grand Mufti Gom’a, Sheikh Ibrahim Madhi, and Mufti Muhammad Hussein quote it on the 45 Modern Sharia Scholar page. 23) 73% of Palestinians agree with that hadith (7/15/11) - count this as one politician. • The same hadith appears in Bukhari and Muslim on Muslim Student Association (MSA) website, and over one hundred MSA's across the USA have all refused to repudiate it or remove it. • The same hadith was on the Muslim American Society (MAS) website, but after Americans Against Hate reported it, they took it down. Here is a screenshot he posted. "The prophet... said: The last hour will not come until Muslims will fight the Jews; until the Jews hide behind rocks and trees, which will cry: O Muslim! there is a Jew hiding behind me, come on and kill him!" "There is no solution to the Palestinian problem except by Jihad." just as much as you love life for the sake of Satan". 28) Quotes of leading Muslim politicians & clerics about Israel & genocide of Jews 1944-2008. 30) Anjem Choudary - English cleric and Omar Bakri Mohammed’s successor, co-founder of the banned Al Muhajiroun, said in an interview that only Muslims are innocent, killing non-Muslims is legitimate. He was among 9 arrested in London September 2014 in a counter terrorism sweep as the new Islamic State grows in popularity.